Pradip Das is Principal Researcher, Experimental Sciences, at The Climate Corporation, a wholly owned subsidiary of Monsanto Company. The Climate Corporation provides uniquely powerful software and insurance products based on its measurement, data science and precision ag platform, bringing agronomic insights to farmers to increase productivity and minimise risks. Pradip’s current research interest is in digital soil productivity for growers leveraging deep integration of data science and precision ag technologies to secure on-farm soil performance leading to agricultural sustainability. technologies to develop prescriptive services for growers. He led Monsanto’s global analytical science platform with labs in US, Europe, South Africa and South America. 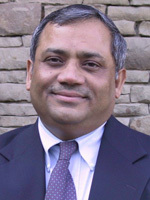 Pradip received his PhD in Chemistry from Virginia Tech, Blacksburg, VA.
Pradip currently serves on the advisory board of the The Sustainable Corn Project, a collaboration of leading land-grant universities in the US, funded by the USDA National Institute of Food and Agriculture, to research climate change resiliency on the farm. He is a member of the American Association for Advancement of Science, American Society of Agronomy, Crop Science Society of America, Soil Science Society of America, Soil and Water Conservation Society, and American Society of Agricultural Biologists and Engineers.